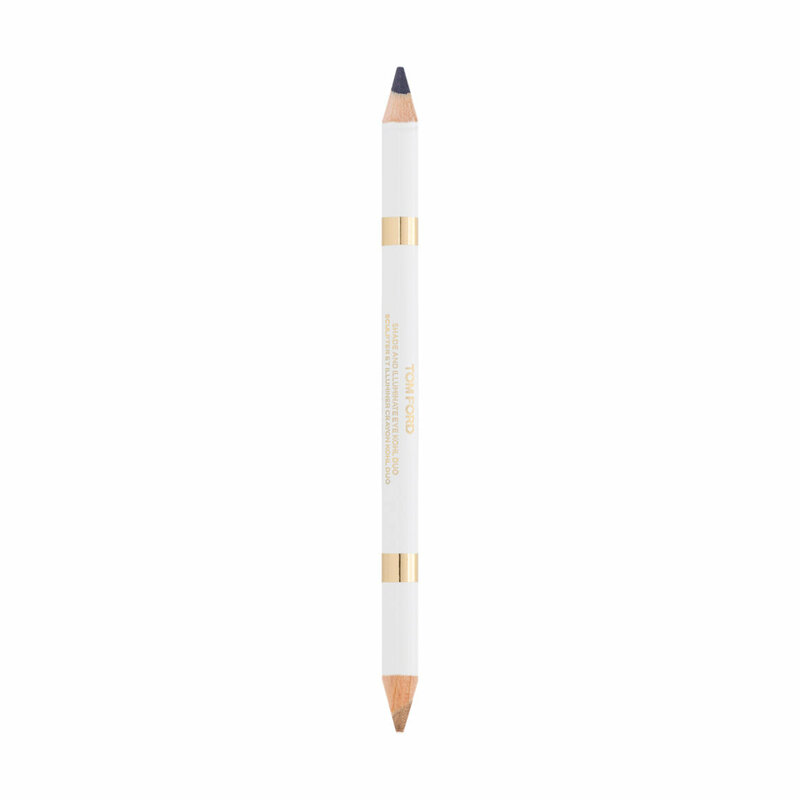 This dual-ended kohl pencil lines, defines, accents, and frames the eyes for a mesmerizing gaze. TOM FORD Shade & Illuminate Eye Kohl Duo features two shades: one to highlight and brighten and one to dramatically define. Rich color pigments glide comfortably over skin with a creamy feel for ultra-fluid application. Apply to your upper and lower lashline or waterline—whatever part of your eyes you want to enhance. Have a question about Tom Ford Shade & Illuminate Eye Kohl Duo? Because I’m having such fabulous results with the new quads, I bought both Aurora & Solaris. Epic FAIL! The pencils were dry & draggy to the point the purple end of Aurora scraped my eyelid. Returned immediately and reverted to my Chanel. It felt like trying to line my eyes with a #2 pencil! What is it with TF & inconsistent quality on eye products lately? No way I could let these near my waterline. Pity, as the colors would be beautiful if I could get them onto my eyelids. I am so glad I invested in this gorgeous product! The name says it all-shade AND illuminate-you truly get both! Firstly, the quality is absolutely exquisite. I'd had the Tom Ford Soleil and especially the Winter Soleil Collection on my wishlist and I treated myself to this(and the TF Duo Primer as well!) as part of my birthday order. I was so impressed by the silky smooth texture of each shade and how they work harmoniously. They glide on and apply so luxuriously-that's the difference that sets it apart from any other liner/kohl I've tried. It didn't irritate my eyes at as it did with the previous reviewer-however, everyone is different. The other difference, besides the shades being absolutely gorgeous and the texture and pigmentation being rich, silky, smooth, and applying so beautifully is the way it applies just as beautifully when applied over rich, textured shadows. I am a huge lover of Natasha Denona's shadow palettes-her shadow formula is exquisite and I love to try different looks where I layer different textures(ie the Cream Powder, the Chroma Crystal, the new Creamy Chroma Crystal, the Duo-Chrome etc...I've found in the past that when I apply liner over a textured shadow or just an ornate shadow look I've found it more difficult to have the liner create definition and last for a long time. However, I found this to be no problem, and I recently just used it with the Cranberry Palette, and it accentuated the look and defined AND illuminated my eyes so beautifully. It also enhances the look of my lashes. NOTE: I did use it with the Tom Ford Eye Primer Duo that I also just purchased which is wonderful(see my separate review for that great product!) So, that's another great bonus-it working so beautifully with that primer! 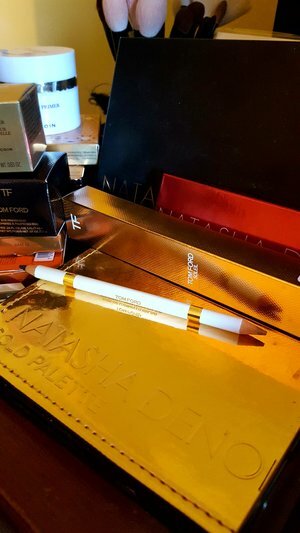 Finally, the shades are a gorgeous combination-and it's most definitely a splurge-worthly product-it's by far the finest Kohl eye product that I've ever used and I look forward to purchasing more Tom Ford from eyes to skin to lips and more! Wanted to love it, love the way it looks, love the fact that it is double ended, love the brand but it just under performs. It smudges down around the outer corners of my eyes and transfers to my undereye area every time I wear it, I even tried setting with eye shadow, they still smudge within half and hour to an hour after application, I wipe it off, it smudges again.